This week Sergeant Barry Evert, veteran practitioner and author, launches his new site on Corrections.com. Evert fans can now get a regular dose of his survival tips, gang information, and industry tactics. His content will also be distributed on the Corrections.com homepage, inside the weekly ezine [to 66,000] and through the Google partner feed at Google.com. 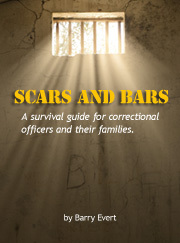 This September, you will also be able to purchase his new book Scars & Bars, a survival guide for correctional officers and their families [pictured here]. The book will be available as an ebook, so there is no waiting for it to arrive and it’s convenient and mobile. If you’re itching to get a copy or want to find out more, leave a comment below. We also welcome any ideas for articles and tips. And don’t forget to sign up for the RSS feeds so you can see when new postings arrive. Corrections.com is the leading online community for Corrections, ranked #1 in Google and Yahoo. We would like to welcome Barry to the Corrections.com family.